Many people often have questions about Chiropractic Medicine and its applications. Dr. Sandez has taken the time to answer a few common questions below in detail. If you have more questions about Chiropractic Medicine or our practice in Cary call our office at (919) 535-3091, Book An Appointment, or use our Online Form to the right. Chiropractic medicine is a system of integrative medicine based on the diagnosis and treatment of neuro-musculo-skeletal conditions. The goal of Chiropractic care is to heal patients and improve quality of life without the use of drugs, injections and surgery. Science tells us that immobility or loss of motion in the joints leads to degeneration and disease. Chiropractic care focuses on findings misalignments in the joints, restrictions in movement and abnormal stress on the nervous system. These restrictions or misalignments often cause irritation/pressure to the nearby nerves, especially those of the spinal column but also in the extremity joints. When nerves get irritated/pressured people may experience dysfunction and pain in muscles, organs or other parts of the body. Chiropractic adjustments restore proper alignment to joints, improving the motion/mobility to that area, relieving pressure to the nerves and decreasing the effect on muscles and organs. This leads to natural healing and improved quality of life. YES! However just like any other form of healthcare, unusual and rare affects are possible. Simply put, if chiropractic adjustments were not safe, professional athletes worth millions of dollars all over the world, would not be getting adjusted on a regular basis. This day in age, many professional sports teams have a Chiropractic Doctor on their medical staff to care for the players. If Chiropractic Adjustments were not safe, I do not believe most health & auto insurance companies would pay for Chiropractic care, as they do. If Chiropractic Adjustments were not safe, Chiropractors would likely have the highest malpractice insurance premiums of all health/medical professionals, however Chiropractors have one of the least expensive malpractice premiums. I think it is safe to say, Chiropractic adjustments are safe If you do not like or want manual/hands-on adjustments, in our practice, we have other techniques that can be used via a special table or instrument to fit your preference. The potential risks associated with adjustments are extremely rare and informed consent is always given to patients before any treatments are done.. Most health and auto insurance companies include Chiropractic coverage. However, the benefits vary greatly and depend on your individual plan. Not all Chiropractic offices accept or work with Insurance. In our practice, we do accept insurance, we verify the benefits in the office for you and we review your benefits with you for your specific case, before starting any treatment plan. In some cases, for example a very high deductible plan, it may save you money being a self-pay patient vs. using your insurance. In our office we DO NOT force you to use your insurance if you do not want to, legally you have the right to choose. We have a professional waiver explaining this. What Is My First Visit Like? The first visit to our office includes a consultation with the Doctor reviewing any and all symptoms or problems you may be having. After the consultation, the Doctor will do a full Chiropractic Examination, typically checking your entire spinal column and any extremities that may be part of the problem(s). This first visit with the Doctor is about 45 minutes. In our office, ONLY the Doctor does a face to face consult and exam with you, no other staff will do this. The Doctor will check your Ranges of Motion, Balance and Posture. Then perform a few Orthopedic and/or Neurological tests as necessary, do manual palpation/feeling of all necessary joints and muscles and perform an sEMG scan of your entire Spinal Column to further assess any muscle imbalances. Depending on the patient’s exam findings and needs, the Doctor may do a treatment on the first visit but sometimes will not. 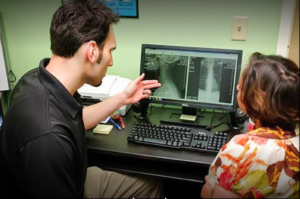 Not all patients need X-rays, however, many times we will get X-rays done for further diagnosis. The follow up visit will consist of a review of your exam findings, where the Doctor will give you detailed information regarding your exam results, what abnormalities were found, what can be done/if we can help, what specific treatments will be done, how many visits to get you well and how much it will cost. All this is reviewed prior to starting any treatment plan, so you are well informed right from the start. Why would a Child or Pregnant Woman see a Chiropractor? Let’s start with the basics. Children and Pregnant Women have Spines too. They have bones, nerves, joints and muscles, all of which can mis-align, causing imbalances and stress on the body, just like anyone else. Children go through more physical changes then any other population, from crawling to walking to running to growth spurts, developmental changes, puberty etc. Children also have more falls then any other population, causing joint, nerve and muscle problems. Many adults who have chronic pains today, had these problems start when they were a child. It would be a great idea to have children grow and develop with great alignment, posture and muscle balance. Pregnant women have several additional stresses put on their body. First, the hormonal changes, can do a number on a women’s body. Ligament laxity or loosening of the ligaments is one example. The change in hormones with pregnancy causes the ligaments that connect bone to bone to loosen, which makes it easier to mis-align. Now add 25-35 lbs of weight gain, most of which is an uneven distribution of weight at that (mostly around the abdomen). Furthermore, the inability to sleep on her back(the best sleep posture for the spine) and yet still, a growing fetus that sits right in front of the sacrum, in the middle of the pelvis. How can she possibly stay in normal alignment and balance? I have yet to work with a pregnant patient where there was NO misalignment present around the pelvic and sacral joints. When these women see a Chiropractor, most say they have an easier time with pregnancy and often a shorter labor & delivery. Children and Pregnant Women should at the very least be examined by a Chiropractor. If symptoms are already present, it’s a no-brainer to make an appointment! El Doctor Quiropractico me puede ayudar con mis dolores? Si usted tiene sintomas o dolores en su juntas, nervios, musculos o huesos es muy probable que un buen Doctor Quiropractico le puede ayudar. A mas, sin el uso de medicinas, inyecciones o cirugia. Dolores de cuello, espalda, cadera, cabeza o problemas en la extremidades son muy comun para un Quiropractico tratar. Si tienes hormigues o entumecimiento casi siempre es problema de nervio pinchado. Problemas de alinacion en la columna pueden afectar los nervios y musculos que causan dolores o sintomas. El Dr. Quiropractico trabaja para alinear la columna, sacar presion de los nervios, relajar los musculos y eliminar los dolores lo mas posible. Se puede cuidar de ninos, mujeres embarazadas y adultos. Para mas informacion en espanol, mira a nuestra pagina de web, la seccion en “Espanol”.